This is the first of a series of articles showing how the authors of the Biblical book of Genesis borrowed many of their key themes and stories from writings of pagan priests and storytellers of the surrounding nations of the Ancient Near East (ANE). The pagan cuneiform inscriptions containing these myths are up to two and a half thousand years older than the earliest possible date of the origin of Genesis. I will examine translations of the original cuneiform writings and show multiple links with Genesis. My conclusion will be that Genesis cannot be considered to be an inspired production of the Christadelphian God, because it is merely a reworking of older pagan theological material. in place of the original gods. This was normal in the ANE. Each culture and civilisation did not invent their own history and cosmology. Instead they borrowed from earlier cultures and inserted the names of their own gods to replace the previous ones. This is what happened with the writing of Genesis. The Hebrew names of God such as Elohim and Yahweh were copy/pasted into pagan stories and presented as the origin of the World and of the Jewish people. To our modern way of thinking this would seem to be trickery and deception. But in the ANE that was accepted as normal. The earlier civilisations were thought to know the truth about how the Earth and man were created and how it was later destroyed by a great flood. That was the science and cosmology of the time and they wanted to preserve that wisdom. The newer writers saw their work as correcting the previous accounts by substituting the names of their own gods; but they did not substantially alter the key details of the earlier narratives. Therefore the most valuable texts for us are the original writings that predated all others. If we can find the origins of the Biblical book of Genesis in those writings, the idea that a thousand years later the Hebrew God inspired Genesis will be proved to be false. If the very first book of the Bible is shown to be the product of ancient pagan priests and plagiarist Hebrew scribes, the veracity of rest of the Bible will be suspect. 1. It was the Sumerians who developed and probably invented the cuneiform system of writing which was adopted by nearly all the peoples of the Near East and without which the cultural progress of western Asia would have been largely impossible. 2. The Sumerians developed religious and spiritual concepts together with a remarkably well integrated pantheon which influenced profoundly all the peoples of the Near East, including the Hebrews and the Greeks. Moreover, by way of Judaism, Christianity, and Mohammedanism, not a few of these spiritual and religious concepts have permeated the modern civilized world. 3. The Sumerians produced a vast and highly developed literature, largely poetic in character, consisting of epics and myths, hymns and lamentations, proverbs and "words of wisdom." These compositions are inscribed in cuneiform script on clay tablets which date largely from approximately 1750 B. C. In the course of the past hundred years, approximately five thousand such literary pieces have been excavated in the mounds of ancient Sumer....."
- 'Sumerian Mythology' by Samuel Noah Kramer. The Sumerian myths date to a minimum of 1,000 years before the Genesis account was written. It was THE cosmology of the day and THE science of the day. It influenced the later Chaldean and Babylonian cultures and from them spread far and wide to many other cultures in the surrounding nations including the Assyrians, Hittites, Hurrians, Akkadians, Elamites and Canaanites. It found its way through Hebrew scribes into the record of Genesis. 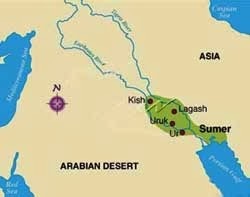 Abraham and his family came from Ur, which on three different occasions was the capital city of Sumer. 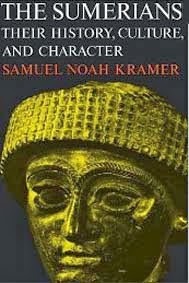 Abraham was NOT a Semite; he was a Sumerian. In Genesis 24: 3-4 Abraham sent his servant to Sumer to bring back a wife for Isaac, because he did not want him to marry a Semite. The ancient proto-Hebrews were Sumerians and Genesis is influenced by Abraham's Sumerian cosmology, science and theological thinking. 1. By early and direct transference from Sumer by Abraham and his Sumerian family. ﻿I want to begin our investigation of these texts by considering the Sumerian beliefs about the creation of the Earth and of the Universe. Of course "the Universe" to the Sumerians was a far smaller place than the Universe revealed to us by modern science. Before the creation of the Earth and the Universe the Sumerians taught that there was only a totally dark, primeval and boundless sea. Nothing else. There was no Earth. Earth had no form or existence of any sort. There was no dry land. There were no lights in the sky. The original sea went on for infinity and had always existed from infinity. In a tablet which gives a list of the Sumerian gods, the goddess Nammu, written with the ideogram for "sea," is described as "the mother, who gave birth to heaven and earth." Heaven and earth were therefore conceived by the Sumerians as the created products of the primeval sea. An had caused the Anunnaki (his followers) to be born. . . . Therefore, after their creation from the sea, heaven and earth to the Sumerians was originally one united thing; a mountain. The key thing that I want you to note is that the two were united into one form. Heaven and earth were a mountain surrounded by the primeval boundless waters of the sea. But all was still in darkness because no light had been created. Conceived as gods in human form, "An" (heaven) was male and Ki (earth) was female. They were together and united. From their union was begotten the air-god Enlil. The first verse of the Bible tells us that he created one thing called "heaven and earth." They were united because the "firmament" that separated them (verses 6-7) had not yet been created. 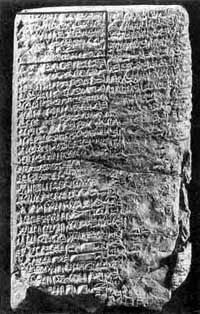 One of the primary sources for the Sumerian conception of the creation of the universe is the introductory passage to a Sumerian poem which Kramer entitled "Gilgamesh, Enkidu, and the Nether World." 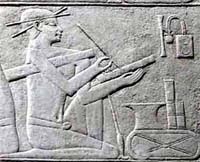 Here we are told that heaven and earth were separated when the Sumerian heaven god An carried off heaven, while his son, the god Enlil carried off the earth. A division between the two was created, in which the wind god Enlil could move freely - in the air. "Enlil" is a combination of two different Sumerian words. "En" = "god" and "Lil" = "Wind" or "Spirit." "And the earth was without form and void and darkness was upon the face of the deep (waters). And the Sprit of God (Ruach-Elohim) moved upon the face of the waters." We have to think of the Sumerian and Hebrew original words; not the English translation. "The Spirit of God" in Genesis 1:2 is "Ruach-Elohim." "Ruach" = Spirit" and "Elohim" = "God." In the Hebrew Bible "Spirit" or Ruach ר֫וּח is translated as follows: air (2) Spirit (76), spirit (127), spirits (3), wind (98), winds (7), windy (2), and with other English words. (Strong's concordance). Note the 107 instances where it is translated "wind" or "winds." Therefore it is not unreasonable to say that in Genesis 1:2 the "wind of God" moved upon the waters. This is identical to the Sumerian creation account, where the Sumerian god Enlil, the god of the wind, who moved over the original infinite boundless sea before the separation of the Earth, was the god who separated the Earth and Heaven by creating a firmament to divide them, and create the Sumerian universe. It was not Yahweh, or El or even the Elohim. It was the divine wind that moved over the deep prior to creation. The stories are similar. A divine wind moved over the deep in both the pagan Sumerian creation myth and the Hebrew creation account in Genesis 1. 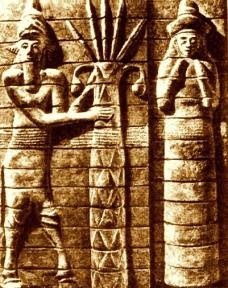 The Sumerian god Enlil mated with his wife Ninlil and the moon god Nanna was born. Nanna, the moon-god, and his wife Ningal were the parents of Utu, the sun-god. Thus light was created in the Sumerian universe. 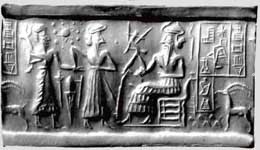 The Spirit god Enlil continued to be one of the most important gods in the Sumerian pantheon for over a thousand years. The curious Biblical character "The Spirit of God" or "The Holy Spirit" that runs throughout Scripture is derived the Sumerian Enlil original. There is no such power as "The Holy Sprit"; it is based on a pagan myth. Moon and stars, shown to the upper left. 1. Both accounts begin with the primeval sea. 2. Both accounts have darkness as the original state. 3. Both accounts have the heaven and earth created as a unity. 4. Both accounts have a divine wind or spirit moving over the waters. 5. Both accounts have this divine spirit power active in creation. 6. Both accounts recount the division of earth from heaven by a firmament. 7. Both accounts indicate that it was the divine spirit that caused this division. 8. Both accounts explain how light was brought into the creation. 9. Both Sumerian theology and the Bible continue with this theme of a spirit power after creation. But in both cases the spirit power is subservient to the principal god. The chief god in Sumerian mythology was An (the god of heaven) and Yahweh (the God in Heaven) was superior to the Holy Spirit in the Bible. 10. Both Sumerian theology and the Bible show the spirit god operating on earth and in the air, but not in heaven. 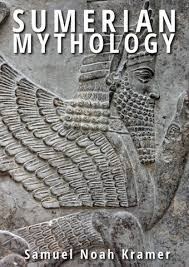 Future articles will show dozens more similarities between the Sumerian and Genesis accounts which demonstrate that the later Genesis narrative was derived from earlier Sumerian myths and not from the supernatural God of the Christadelphians. Who will save them? - God or the US Navy?